God Will Punish Both Obasanjo And Abubakar-Oshiomhole - SWANKYLOADED OFFICIAL BLOG. 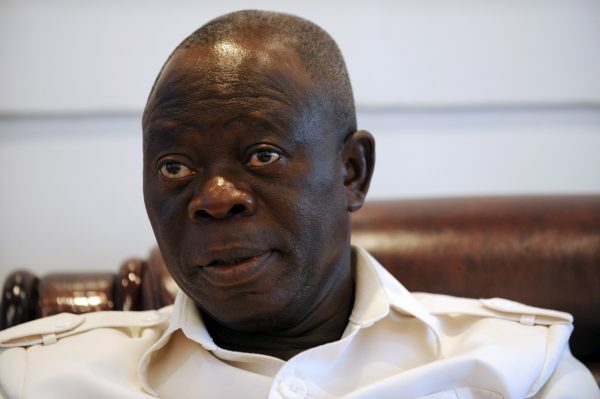 The National Chairman of the All Progressives Congress, APC, Adams Oshiomhole, has prophesier what God will do to former President Olusegun Obasanjo and the Peoples Democratic Party, PDP, presidential candidate, Atiku Abubakar, next February. Oshiomhole said God will punish both Obasanjo and Abubakar by allowing President Muhammadu Buhari defeating them in 2019. He made this known when he spoke to newsmen after receiving APC women leaders from Edo State in his office in Aso drive in Abuja, on Tuesday. “We know there are people across the divide who are fighting back. There is a gang up by those who are used to sucking the system without adding any value but Nigerians will not allow that. “When you are working with me and I said you are a thief, God will punish me if I support you. And when you are confused because your supply line has been chopped off, you now turned around to support the same person.